It's very slow going in the skincare department in my house. I'm still struggling with finding enough time to get my face done between all the things that need to happen to stick to Jellybean's routines. At least there is still progress! At first I didn't like the brush feature of the pen. Then it grew on me. I really enjoyed how long the glaze lasted and kept my lips moisturized. But then I realized the immensely sticky texture of the glaze was awful for kissing babies, husbands, and drinking from travel cups. I really liked using this product. It's not greasy at all. It's perfect for summer for my skin type (combo/oily). It needs reinforcements in the winter. I used it all over my face as a moisturizer. It was really nice to use. It's something between a cream and a lotion. It's hydrating yet doesn't feel greasy. 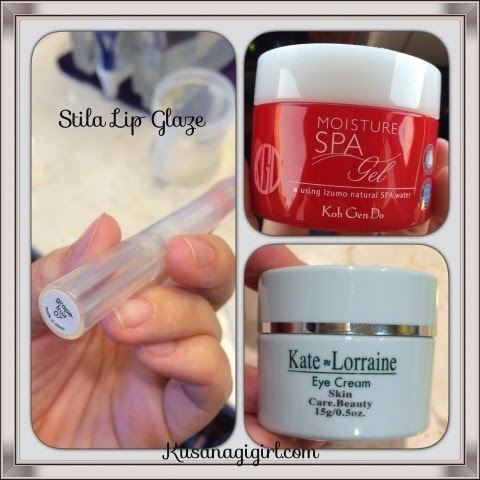 It feels heavier than the KGD Moisture Spa Gel but it absorbs and dries just the same.